With digital audio recorders, there are a lot of options when it comes to the quality of the audio recording. Despite the easy access to these options, they are often overlooked. People are either unaware of these settings, or simply forget to check them when they begin a recording. While most settings on a digital recorder will yield a good enough quality recording, I have come across digital recorders with very low quality settings that could result in very distorted or unintelligible recordings. 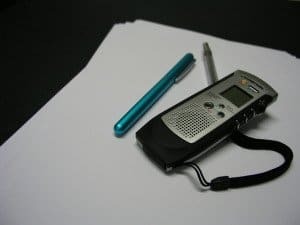 If you are using a digital audio recorder, it is important to have a basic understanding of what contributes to the quality of your audio recording. Two major settings to be aware of are the sample rate and the bit depth of your recording. The sample rate determines how often a sample is taken from an incoming waveform. The bit depth determines the number of bits for each one of these samples. Together, these settings and the number of channels will determine what the bitrate is. The bitrate is how many bits are processed per a period of time. Bitrate plays a bigger part in lossy audio files. There are a few standard sample rates used in most recorders, often including 44.1kHz, 48kHz, and 96kHz. Audio is usually recorded at 44.kHz to capture the full range of human hearing. An audio waveform has a positive and negative pressure area; therefore a minimum of two samples must be taken from a frequency to reproduce it. The range of human hearing is generally given as 20Hz to 20kHz, though it can vary depending on the person. With a sample rate of 44.1kHz, frequencies as high as 22kHz can be recorded, which more than covers the average person’s hearing range. Higher frequency ranges such as 96kHz are used to capture twice as many samples and therefore create a higher quality recording, though most would argue that it is almost impossible to hear any quality difference unless using professional audio equipment. The bit depth, as mentioned, determines the resolution of each sample that is taken. A 16 or 24 bit setting is most commonly used; depending on what medium is being used. Audio CD’s, for example, only use 16-bit audio. The bit depth will determine the signal to noise ratio of a recording depending on a logarithmic formula. The signal to noise ratio is the comparison of the desired signal to background and internal noise. A 16-bit recording will have a 96dB signal to noise ratio, while a 24-bit recording will have a 144dB ratio. While 24-bit does have a higher SNR, the 96dB range of a 16-bit recording is often more than enough to create a good quality recording. When using a format such as an MP3, bit depth no longer applies because of the lossy compression format. This is when bitrate becomes a more important factor of a recording. The bitrate is the number of bits processed in an amount of time, typically written in kilobits per second. The bitrate of an uncompressed audio file, such as a .WAV file, can be determined from the bit depth, sample rate, and number of channels. A CD with 44.1kHz, 16-bit stereo audio has a bitrate of 1411kbps. MP3 and other lossy audio files typically have much lower bitrates, which is why they are so much smaller than uncompressed formats. They achieve this through perceptual coding, which essentially removes parts of the data that are found to be unnecessary and unperceivable by the human ear. Typical MP3 music files have bitrates between 192kbps and 320kbps in order to maintain good quality. Digital recorders that record lossy formats will often have optional bitrates as low as 32kbps. When choosing what settings to use for a recording, it’s important to consider the purpose of the recording. Music production is usually done with at least a 44.1kHz sample rate and a 16-bit depth. WAV and AIFF files are typically the file formats used for the master recording. When later compressed to MP3, as mentioned before, a bitrate between 192kbps and 320kbps is used to maintain the highest quality possible after compression. When a digital recorder is being used for another purpose, such as recording a conversation, other settings may optimize the performance and memory of the unit while still maintaining a high enough quality. Whenever a smaller sample rate, bit depth or bitrate is used, the recording will always take up less space on the memory of the recorder. This can be very important to someone who may need to leave the recorder on for long periods of time. When capturing audio evidence, a recorder may need to be left on for hours or even days. If this is the case, and a lower quality file needs to be used, it is important to know how to go about maintaining quality while optimizing the memory. While the range of human hearing covers up to 20kHz, fundamental frequencies of voice do not fall in the higher end of the frequency range. The human voice is strongest in the 1kHz to 4kHz frequency range. Because of this, it is possible to capture a completely audible and intelligible recording of people talking with a sample rate of only 22kHz. This would mean the highest frequency recorded would be 11kHz, which is still much higher than the most important frequencies in the voice. Some recorders can even be set to an 8kHz sample rate. While this does save a lot of space on the recorder, this means the cut off frequency would be 4kHz. This may be acceptable for some applications but may also cut down on the clarity of the voices. When a large amount of background noise is present, the higher frequencies between 4kHz and 10kHz can add some needed clarity to the voices. It is always a good idea to test the different sample rates before using them to make sure that the quality will be adequate for its purpose. When trying to optimize the memory on a digital recorder, it is almost always a good idea to use a lossy compression format, such as an MP3. This means that determining the bitrate rather than the bit depth will be a factor in the size of the recording. As mentioned before, a bitrate between 192kbps and 320kbps is often very good quality for an MP3. When recording only a voice in which the content of the recording rather than perfect quality is the concern, lowering the bitrate can be very helpful for conserving space. One should be cautious when lowering the bitrate because the data compression may begin to affect the intelligibility of the recording. When too much compression is introduced, digital noise become easier to hear, which can sometimes cover up the desired signal. I have heard 32kbps recordings that had so much added digital noise that the much of the conversation in the recording had become unintelligible. In summary, digital audio quality is determined by its sample rate and bit depth or bitrate. There are many options for these settings and not all of them may result in a good quality recording. It is always important to check these settings and be aware of the limitations each setting comes with before beginning a recording. Take into account the content of what you are recording and the quality of audio that is needed. The better you know your digital recorder, the more effective it becomes.